and troubleshooting, we’re here to help. For manuals & product support, start typing the name of your product here. You can also browse by category and product below. Register your product so you get the most out of your warranty and so we can assist you better if you call in for phone support. From transmitter placement and wire installation to training and troubleshooting, we’re here to help. You’ll have your fence set up in no time! Need remote training tips? Need fitting advice for your Easy Walk® Harness? Browse articles and videos and FAQs on setup and training here. For help and advice on training your dog with our range of Bark Control devices, and making sure that they are used effectively browse articles, videos and FAQs here. Installing a Pet Door is easier than you think. See our installation and after-care advice, videos and FAQs here. Caring for your pet couldn’t be easier with our range of Pet Fountains and Feeders. Find out about accessories, and browse articles and videos here. Pets just want to have fun! Watch our fun videos and access articles and advice on keeping your pet active. Not sure if a self-cleaning litter box is the right option? Watch our video and see it in action. 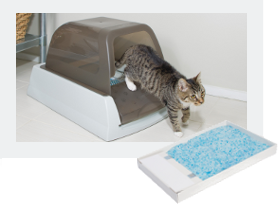 Need potty training tips for your Pet Loo™ pet toilet? Browse our FAQs and videos. Unsure how to keep your pet comfortable and safe during travels or how to give access to elevations at home? Browse articles and videos on our Travel Access & Mobility products here.